"On a personal level, I am both humbled and honored to stand here before you as a child of Chinese immigrants representing the US, the land of my birth, and the American values my family holds dear." And so, Gary Locke wants to share his American values with the Chinese people and perhaps, to promote American values in China. Here are 2 reports about Gary Locke in China. Gary Locke has become a minor celebrity in China for his modest, unassuming lifestyle, drawing the apparent ire of state-run outlets. Former US Commerce Secretary Gary Locke has been creating a buzz in China since he arrived last month to take up his new role as US Ambassador. He is the first Chinese-American ever to fill that position, and curiosity about him is running high. Last month, a Chinese tourist posted online a photo he took of Locke sporting a small backpack and buying his own coffee at the Seattle airport Starbucks. That photo launched endless online comments in China – surprise, admiration, because Chinese officials would have legions of flunkies to do this kind of thing for them, jokes that America must really be short of money if the US Ambassador has to fend for himself. Chinese officials and media may have different opinions on Gary but the Chinese social media has all the positive remarks and comments on Gary. Divide Adelman, is the American ambassador to Singapore, who came here last year. He caused a flap when Senator Jim Webb asked him whether he intended to engage Singapore on the issues of democracy and press freedom. "Make no mistake, currently Singapore is not a multiparty democracy, and I intend, if confirmed, to use public diplomacy to work towards greater press freedoms, greater freedom of assembly and ultimately more political space for opposition parties in Singapore to strengthen Singapore into a multiparty democracy," he replied at his nomination hearing in February, reports the Straits Times. Now, the Singapore newspaper adds, Adelman has clarified that Singapore's domestic politics is for Singaporeans to decide. (Adelman, who had served as an Assistant Attorney General in Georgia and taught political science at the University of Georgia, also praised Singapore at his nomination hearing. He praised Singapore for its commitment to free trade and helping in Afghanistan and Haiti and guarding against piracy. "At the top of my agenda will be promoting commerce and trade between the U.S. and Singapore," Adelman said after being confirmed in his post by the US Senate. Apparently, Gary is promoting American values and Adelman is promoting commerce and trade. So, Adelman must have an easy time in Singapore as values, being intangible, are difficult to promote than trade and commerce. It is especially difficult to promote American culture in China which has more than 5,000 years of civilization. Comparing Adelman and Gary, both US ambassadors are so different. One seems to be more humble than other. One seems to know how to use ‘public diplomacy’ more effectively. Gary never promised anything but Adelman seemed to suggest during the confirmation hearing, he wanted to bring or promote American values in Singapore, in a ‘public diplomacy’ way. This is what we called 雷声大雨点小. The thunder is making a big bang but when the rain comes, it is very small. However，Gary started humbly before going to China but makes a great impact to Chinese people, perhaps a big shock too to the Chinese leaders. I think we can expect very little from the US ambassador to Singapore. If we are expecting changes, hope to see changes in Singapore political developments, want to make the PAP listening to the people, we have to work it out ourselves. At the end of the day, the Americans and the west are only interested to make money in Singapore. Singapore is a very comfortable hotel to them, even more comfortable than their home towns. But can Singapore continue to be a one-party democracy? Will a one-party democracy more stable than a multiparty democracy? May be there is a double standard when comes to money politics? Soon, we will have to import foreign talents as our Chinese elites as we are unable to train and educate the critical mass of such people. This is not the worry of the Chinese community and educated persons in Singapore, but also the government. It is quite obvious that the Ministry of Education will not be able to produce enough Chinese elites for the future need of Singapore or the kind of bilingual elites that the PAP is looking for. These so-called Chinese elites are in short supply and no matter how we try to promote the use of Chinese language, we will never be able to produce the critical base of local Chinese elites in Singapore. Even though Minister for Education Heng Swee Keat said all political appointment holders at MOE are looking after the bilingualism but it is very clear that we have lost the cultural DNA to produce elites in Chinese as well as in India and Malay. The Minister said “All of us (political appointment holders) will continue to pay due attention to the teaching and learning of the English Language and our Mother Tongue Languages” in his first major policy address to school heads at his ministry's annual workplan seminar last week. Few will expect current education policy and language environment will turn out enough numbers of local Chinese elites in Singapore, a worry since the closing down of Chinese schools in the 1980s. As usual, the government way of solving problems is if there is no enough, we import them, likes the changes in immigration policy to make up the low birth rate, and the adjustments in the foreign workers policy to meet the demand of manpower need. Soon, we will have to do it at a large scale by importing Chinese elites. In fact, we have already been doing so in the past 10 or 20 years. For many years, we have been importing Malaysian Chinese, especially those graduated from Chinese independent schools. These schools are like our old Chinese schools in Singapore and students there study Chinese as their first language. The term “Chinese elites” may not be appropriate as to make up the critical mass, we also need other non Chinese elites or less intelligent people but with Chinese proficiency to come out with the required size of numbers for our economic needs. Hence, like the foreign talents and workers policy, we will need to import skilled and unskilled Chinese elites and people from China, Taiwan, Hong Kong as well as the traditional source, Malaysia. Will there be a future without a root? The theme of this year’s Work Plan Seminar is “Our Children. Our Purpose. Our Future.” If MOE and the government really concern about the future of our children and the purpose of education, then they should re-look and re-focus the basis, especially MOE wants to emphasize on value and character building and development of our children. Singapore is an Asian society. Unless we think we can totally immerse into a western society with their value system and personal behaviours, otherwise, we better try to keep our root as what former PM Lee Kuan Yew have suggested during the launch of his Chinese version of “Hard Truths”. The best way to do this is to have a better understanding of Mother Tongue. Japan has wanted to be a western country since she adopted western system of government, science and technology and administration. However, until today, it is still not a western country culturally. Perhaps, Singapore can out do Japan as we are willing to give up our language and culture. The PAP always wants to stress that Singapore is an Asian society so that we do not have to follow the democratic practices in the West. They use this as an excuse to be different from the West. But don’t they realise that we are also different in culture and value system? Without the support of the Asian root, culture and value, Singapore will as normal as a white banana. All four presidential candidates did not communicate well in Chinese is another setback for Chinese learning in Singapore. In future, it will be very hard for Singapore to have a President who can speak and understand Chinese like Ong Teng Cheong. In fact, the local Chinese speaking community is declining too. Readers of Chinese newspapers have a sizable numbers of non local Chinese. Even though the circulation of Chinese press does not decline, this does not mean that there is more local reading the Chinese papers. It is mainly because the loss of readership is made up by Chinese readers from China. Few years ago, the newly appointed President of Nanyang Technological University has an ambition plan to drop the word “Technological” from NTU. It wants to date back the university to 1955, the founding year of the old Nanyang University. You can date your history back to whatever date you like. However, you can’t bring back the value and the cultural DNA. Anyway, the change of name is not successful. For the case of Chinese elites in Singapore, it will also like the fate of the old Nanyang University, a history to remember. Can you import Nantah spirit? Can you import Chinese elites? Can value and culture be so cheaply imported? Singapore Inc Is Built To Last or Built To Make Profit? The ultimate creation of the first generation leaders of the PAP to Singapore is Singapore Inc. It is not about the economic growth, housing development, jobs and other achievements that the current PAP government keeps on reminding the people. Singapore Inc is built to last first and then built to make profit. If we are to be built to make profit, then a colony status or a semi-independent status like Hong Kong with a big brother protection may be a better solution. Another myth of Singapore Inc under the PAP government is the need to have great and charismatic leader. This is why they keep on stressing the A team. There is only one team of top class leaders is available in Singapore and this team is from the PAP. This great leader theory has been implanted and practiced in our business and commerce, especially in the government linked companies. The recent appointment of Wong Kan Seng and Dr Lee Boon Yang as the chairman of Singbridge and SPH respectively is a clear example. This kind of practice is to guard the GLCs and prevent them to make creative moves. It is to keep their operations in line with the Temasek and government polices that are engineered by the PAP. There are many similar appointments with ex-ministers, retired civil servants, former military and police personnel at GLCs inside and outside of Singapore. These appointed chairmen or presidents are just blindly guarding and following the PAP’s instruction but not the Singapore Inc’s – the wishes of the people. GLCs are not only controlling our economy. In addition, it has discouraged the development of entrepreneurship in Singapore. These GLC enterprises have co-operated with each others to prevent competitions. Look at the telecommunication sector, the transport sector, etc; one will see the true picture. And we should question their existence is for the people or the PAP. Singapore Inc is an ultimate creation and within it, there is a part called GLCs and the PAP. However, they are not only obstacles to the growth of the country, but also act as destroyers to creative ideas and alternative suggestions. OR: You are either following the PAP or against the state. The PAP always projects a wrong OR thinking in Singapore. If you oppose the government’s policies, you are wrong. If you go against the policies, you are trying to create troubles and you are against the law. If you want to have high growth, you need to increase the immigrants. If you are a female and want to have a PhD, you will end with no family. If you want to vote for an opposition, you will be served last. If there are two A teams, the country can not compete with other countries. So, we can only have one strong A team. The OR is dividing Singapore as a country and we should consider the AND under the Singapore Inc.
AND - Both the PAP and the oppositions are present under the Singapore Inc. Each has their role and makes contribution to Singapore Inc and the people. If you want to have checks and balances, you need to have a strong and effective opposition in the parliament. If the government is listening and wants to have the real feedback, it must treat the people with equal no matter they are oppose or support the PAP. If you want diversity, you should not allow the government institutions to be used only by the PAP. The resources must be shared by different camps and people. The AND is uniting the people and will build a strong Singapore Inc.
“The test of a first-rate intelligence is the ability to hold two opposed ideas in the mind at the same time, and still retain the ability to function.” – F. Scott Fitzgerad. May be the PAP is not able to produce the first-rate intelligent leaders with two opposed ideas. However, Singapore Inc is a larger identity than the PAP. It is able to have two opposed ideas and is still able to function effectively. Or, perhaps, the day will come when the opposite camp is able to produce first-rate leaders who are able to handle difficult questions and opposed ideas from the PAP as well as governing Singapore effectively. This is the hope and aim of Singapore Inc.
Former Prime Minister Lee Kuan Yew launched his Chinese version of Hard Truths last week. But the headlines of Chinese and English medium are quite different and it serves no benefit to both medium readers by not giving the true picture of Lee’s speech. Simply put it. Both medium are giving the wrong headlines to the wrong readers. There is no impact and it will not stimulate the learning of Chinese language in Singapore. 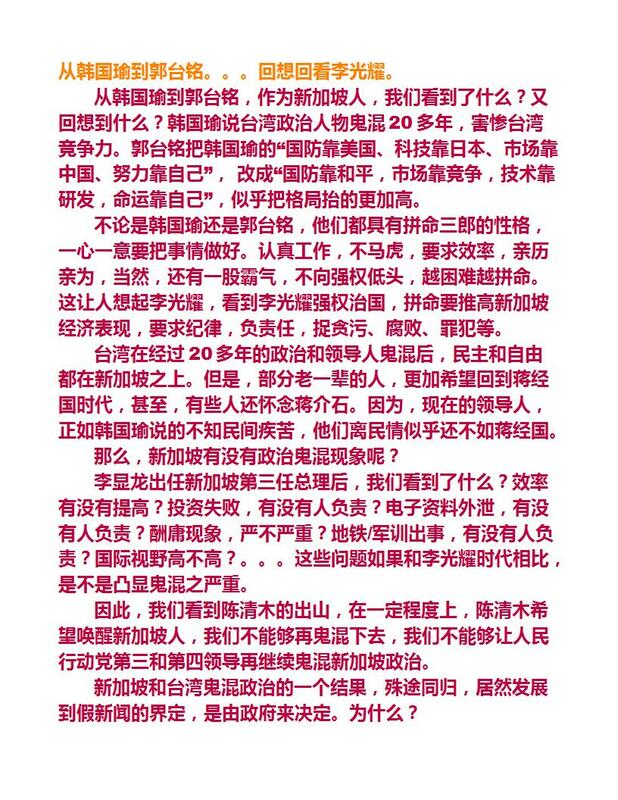 Zaobao gives a strong message to Chinese readers who already have the knowledge of Chinese language. Why sells something to a buyer who already has the product and know the importance of owning it? If you are an English reader, after reading the above headlines, will you be moved to learn the Chinese language? The Asiaone headline may provide the financial incentive to learn Chinese but what is the real reason for wanting to learn Chinese for Chinese Singaporeans? It is really a tall order. For many Singaporeans, our root is English not Chinese. This is why when the English medium report on the Chinese Hard Truths, they all want to select a headline to comfort their readers. A strong language or message like the one in Zaobao may not serve the English readers well. But in such a way who is telling the Hard Truths about the Chinese language in Singapore. Zaobao, Straits Times, Today, Channelnewsasia all are telling the true stories to their readers or just want to please them by selecting the right angle to report on the Chinese Hard Truths. Is Zaobao a main stream paper? Zaobao is a main stream paper but certainly not the main stream of the main stream. The honor has to go to the Straits Times and/or CNA. So, the officially main stream position is there is no regret and there is no Chinese root to search for. Even though the honorable Lee Kuan Yew used the words of regret and root (in his Chinese speech), the real main stream media can still select headlines and key points that they want to report on. They may have a point as Lee did not say it in his English speech and so the official position is no regret no root as the master language in Singapore is English. This, perhaps, is one of the biggest hard truths in Singapore. The controlled media is telling different readers different hard truths that they should receive from the main stream media. Singapore has entered an era of no great leaders. In fact, when Goh Chok Tong took over as Prime Minister in the 1990s, Singapore had already begun a new phrase of leadership renewal without strong leaders. From independence until the 1990s, Singapore experienced strong leadership and teamwork. The first generation PAP leaders have helped to build up an ultimate creation that functions like a self-renewal organization that is called Singapore Inc. We may not totally agree with how the Singapore Inc is being established. However, we should thank and give credit to the PAP for creating such a strong and powerful organization. When the Singapore Inc was established, the founding members and leaders of the PAP were idealists and had certain philosophies in mind to a Singapore or a Malaysia. It is not a purely economic reason. The first generation leaders had their visions, missions and values in mind and based on these beliefs they built up Singapore Inc. Just like a visionary company, a pure profit maximization vision will not go too far and last too long. Half way in my writing, I suddenly realize I don’t quite understanding what Singapore vision or value is. We are quite remote from the Swiss standard of living as promised. And 5C certainly cannot be a vision for most of Singaporeans. Since 1966, we have achieved some common identities and in a certain way English is also the common language for the locals. But how far are we away from the 1969 vision? The PAP has itself in the past 20, 30 years intentionally moving away from its own created vision. But Singaporeans under the education and training of the Singapore Inc have remained and continued with this spirit and vision. And who is right and who is wrong? The PAP, especially the conservative, looking for profit maximization and high economic growth is moving away from the National Pledge or the majority of the Singaporeans. However, this Singapore Inc is not belonged to the PAP and it now belongs to all Singaporeans. The PAP is the creator but no more the owner of Singapore Inc. It belongs to both the PAP and non-PAP supporters. Importantly, it is wrong to continue to assume everything in Singapore Inc is belonged to the PAP. The PAP, especially their first generation leadership, must have the confidence on their created product: Singapore inc. And they have to accept that their children of their children may be the leaders of the oppositions. During GE2011, when PM Lee mentioned about the 4th generation leadership of the PAP, he seemed to forget the existence of Singapore Inc and its potential, under the Singapore National Pledge, to produce future leaders. There is a succession plan in our 1966 vision. The ultimate creation of Singapore Inc will create the new leaders of Singapore in its own way but not the PAP way. It will come naturally, but not necessarily from the PAP, for the PAP but for Singaporeans at large.